How Russian propaganda whipped up allegations of anti-Semitism in Ukraine during the country’s 2014 protests — and why that makes it more difficult to talk about anti-Semitism in Ukraine today. Earlier this year, more than 50 members of US Congress issued an open letter demanding American pressure on Ukraine in response to recent “incidents of state-sponsored Holocaust denial and anti-Semitism.” The lawmakers called on Kyiv to “unequivocally reject Holocaust distortion and the honoring of Nazi collaborators and fully prosecute anti-Semitic crimes,” a claim rejectected as “a mix of incompetence and deliberate distortion of information” by Ukrainian memory czar Volodymyr Viatrovych. In a previous analysis, Sam Sokol briefly touched on Ukraine’s efforts to rehabilitate its wartime nationalist movements – many of whose members had been involved in the ethnic cleansing of Poles and Jews. This campaign, a throwback to the memory policies of President Viktor Yushchenko, was strongly supported by the country’s post-Maidan political leadership and made ideal fodder for Russian propaganda, which sought to portray Ukraine as a hotbed of fascism and anti-Semitism. This revisionist historiography reemerged shortly after Russia began a vicious propaganda campaign against Kyiv. Here, as part of the propaganda war waged alongside the physical conflict, the Kremlin portrayed Ukraine’s post-revolutionary leadership as a “fascist junta” – one out to get Jews and other minorities. The Russian state weaponised allegations of anti-Semitism while Ukrainian groups attempted to create a new national historiography centered around the perennial struggle for independence in which vicious anti-Semites and war criminals, suitably rehabilitated, were held up as examples for those currently fighting against the Kremlin’s revanchism. Ukraine’s memory wars, little known in the west, are a perfect example of how narrative has become central to 21st century war. Already at the beginning of EuroMaidan in late 2013, Russian media began tying the revolutionaries to fascism and Nazism. State media played up the involvement of far right elements such as Svoboda and Pravy Sektor (Right Sector, a group formed as an informal union of ultra-nationalist factions at the beginning of the protest cycle), highlighting a series of anti-Semitic attacks that had put Kyiv’s Jews on edge. Here, the Kremlin presented itself as a defender of Russian and Jewish populations in Ukraine, especially in Crimea and the Donbas, who they alleged were threatened by nationalists in the newly formed revolutionary Ukrainian government. Russian media promoted a narrative centered around the historical parallels between the Russian army as a descendant of the Soviet Union, which defeated Hitler, and Ukrainian nationalists, who collaborated with the Nazis, as predecessors of the current rulers of Ukraine. All rights reserved.Protest chants such as “Glory to the nation! Death to the enemies!”, which had its origin in the cant of the Ukrainian Insurgent Army (UPA), were highlighted as examples of Ukrainian racism while the increase in security at synagogues and other communal institutions was held up as proof of the Jews’ fears. Meanwhile, out of either conviction or a desire not to alienate demonstrators at the numerous Maidan protests, local Jewish leaders repeatedly blamed anti-Semitic incidents, including several stabbings and beatings, on alleged Russian provocateurs. Around the same time, Misha Kapustin, a Reform Rabbi in occupied Simferopol, decided to move abroad. Immediately after the Russian takeover of Crimea, anti-Semitic graffiti appeared on his Sevastopol synagogue in what many suspected was an intentional effort by Russia to prove its propaganda claims true. Kapustin was shocked when an interview he had given to the Kremlin-backed Russia Today television network was broadcast, painting his move as an escape from Ukrainian Judeophobes. This claim was as far as reality as possible. In the coming years, as war gripped the country and the economy sunk deeper into recession, many thousands of Jews ended up fleeing, but not one out of dozens interviewed by this article’s authors indicated that they left because of anti-Semitism. The question is: why would the Kremlin have an interest in Ukrainian Jews? The truth is, it didn’t. It would be incorrect to assert that the media reports of Ukrainian anti-Semitism were particularly useful in and of themselves in rallying Russian domestic support for action in Ukraine. We would contend, however, that the use of Nazi imagery did serve a distinct purpose. The instrumentalisation of the Jewish issue was key to Vladimir Putin’s goal of awakening Russian national memory related to the Second World War. Known to former Soviet citizens as the Great Patriotic War, the memory of the millions of lives lost in the struggle against Nazism and fascism still resonate in Russia today. During the Putin era this idea has been turned into a national semi-religion in which war veterans are treated like saints and martyrs, and symbols such as Saint George ribbon have become a symbol of patriotism, loyalty to the regime and Russian pride. By packaging the war as a fight against the modern-day successors of the Nazis, Putin was able to tap into a reservoir of emotion – incredibly useful in any attempt to mobilise popular support. Accusations of anti-Semitism also provided Putin with a (flimsy) pretext for interference in his neighbour’s affairs, while supplying a ready-made propaganda weapon for the delegitimization of the new administration in Kyiv. Anti-Semitism is one of the more pressing issues in contemporary Europe and by linking Ukraine to troubles in France, England and elsewhere, the Russian leadership apparently hoped to influence public opinion abroad to at least some degree. Of course, this story was a complete fiction. Local Jews knew nothing of the attacks, with one local leader telling the Jerusalem Post that there was “no question that from the beginning we became a tool. Both sides are trying to say (they) are the protectors” of the Jews. This was unquestionably true, as after the “attacks,” the leadership of Pravy Sektor actively sought to engage with the Jewish community in order to brand itself as Philo-Semitic. Reality, as always, was somewhat ambiguous. At the same time, statistics provided by local Jewish communities did indicate a measurable increase in anti-Semitic activity in Ukraine, primarily vandalism and arson aimed at Holocaust memorials and similar sites. For the most part, however, anti-Semitic violence, so common in Western Europe and almost unheard of in Eastern Europe, calmed down after the initial surge during the Maidan period. That being said, there was a definite tendency to overlook racist and anti-Semitic sentiments on the part of those engaged in the fight against Russian revanchism, some of whom, like Neo-Nazi Vadym Troyan, a former member of the violent and xenophobic group Patriot of Ukraine, obtained positions within the country’s law enforcement. Meanwhile, Ukrainian efforts to rehabilitate ultra-nationalist fighters, primarily affiliated with the OUN (Organization of Ukrainian Nationalists) and its militant offshoot UPA (Ukrainian Insurgent Army), created something of an unpleasant atmosphere for the country’s Jews, even as most, if not all, of those leaving during this period cited Russian aggression and economic factors rather than anti-Semitism as the reasons for their emigration. Despite the Ukrainian far-right Svoboda party’s fall from grace in the first post-Maidan parliamentary elections, Russian propaganda continued to paint Kyiv as a city run by anti-Semitic fascists. The Ukrainian government rejected any accusation of sympathies towards Nazism and anti-Semitism. The contemporary Ukrainian historical narrative emphasises its struggle with Russian imperialism, which has affected Ukrainian society since the council of Pereyaslav (1654) that assigned Ukrainian Cossacks to the Tsar of Muscovy. According this narrative, Ukrainians and Jews are victims of Russian imperialism – therefore Ukrainian nationalists, as well as Ukrainian and Jewish dissidents, are actual allies in this struggle. From the late 1980s, Ukrainian historiography has searched for a new national meta-narrative that could replace the outdated Marxism-Leninism and contribute to the new country’s nation-building program. Ironically, this wish to withdraw from the Soviet past has repeated Soviet patterns of following a single “general line” on historical interpretation, which aimed to educate people in a preferable way, and has limited public discussion. Eventually a meta-narrative reflecting the views of the Ukrainian diaspora gained ascendancy. This narrative is based on two pillars: glorification of OUN/UPA and victimisation of Ukrainians in reference to the Holodomor famine. After the Second World War, many Ukrainian nationalists and veterans of nationalist military organisations found themselves in exile in Europe and North America. 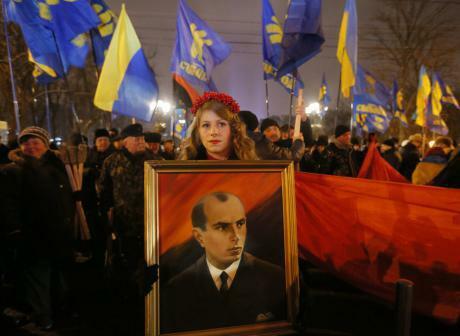 Ukrainian nationalists in the diaspora continued the process of denying their previous anti-Semitism which had begun in 1943-1944, when Nazi Germany started to lose ground against Allied forces. The Maidan spirit was widely seen in Ukraine as uniting Ukrainians and Ukrainian minorities and molding them into a single nation. Nevertheless, after the adoption of legislation on the legal status and honouring the memory of fighters for independence of Ukraine in the 20th century (2015), members of the OUN (Organisation of Ukrainian Nationalists) that collaborated with the Nazis and contributed to the murder of thousands of Ukrainian Jews, were proclaimed national heroes. Official Kyiv completely whitewashed OUN members from their crimes, using their images as examples of Ukraine’s struggle with Russian imperialism and foreign oppressors. This politics of whitewashing divided opinions in Ukraine’s Jewish community: while some Ukrainian Jewish leaders and intellectuals supported this upgrade of the historical canon as progressive and “pro-Ukrainian”, others were alarmed by the possible consequences of glorification of nationalist and anti-Semitic groups. This dynamic can be seen in the recent decision by more than 40 communal leaders to issue a joint statement disavowing Josef Zissels, head of the Association of Jewish Organizations and Communities of Ukraine (Vaad), after he publicly condemned dozens of US lawmakers critical of Ukrainian memory policy. The Congressmen, Zissels stated, had collaborated with “political technologists working for the Kremlin” as part of “a new wave of anti-Ukrainian propaganda of anti-Semitic speculations”. This memory war led to increased tensions with neighbouring Poland, which considers the UPA’s campaign of ethnic cleansing of Poles during the Second World War to have been a genocide. As Ukraine’s decommunisation programme put into place in mid-2015 has sped up, Poland and Ukraine have entered into a diplomatic battle over the Volhynia massacres, showing that Ukraine’s memory policy has had a negative effect on its relations with its neighbours, many of whom have their own nationalist interpretations of history. Not content with fighting only over history, however, the Ukrainian authorities took a page out of Russia’s book and used allegations of anti-Semitism against Moscow. In one high profile incident, President Poroshenko accused the Kremlin of cultivating anti-Semitism in Crimea, claiming that Crimean Jews were being “oppressed” and had been banned from attending synagogue. Despite a rise in vandalism of Jewish sites since Maidan, Ukrainian leaders continue to blame Russian agents for anti-Semitic incidents, characterising them as provocations intended to harm the Ukrainian government. Official Kyiv’s willingness to turn a blind eye to escalating far-right violence over the past two years — including against the far-right’s political and ideological opponents, feminists, liberals, the LGBT community and Roma — as well as the well documented ties between senior officials such as Interior Minister Arsen Avakov and the Azov Battalion, are incredibly worrying. Neo-Nazi groups like C14 and the National Corpus have been allowed to patrol the streets of Kyiv and it appears that while they have not enjoyed much electoral success, certain Ukrainian extremist groups benefit from support from state structures. Even if far-right aggression towards Ukrainian Jews is now hidden and revealed only by graffiti on synagogues and posts on social media, their actions show that the situation can be changed dramatically – the far right now feel their power after discovering that they can act with relative impunity. While allegations of anti-Semitism in Ukraine were largely propaganda during the first two years of the conflict between Russia and Ukraine, there is now real concern that Kyiv’s policies are emboldening extremists.